NQ Environmental Commercial Clarifier UV HEPA Carbon Air Purification Filter System. "NQ Environmental" (NQ) was founded ten years ago to develop and market products to address air purification needs of the general marketplace. NQ Environmental is now one of the leading manufacturers of products that deal with indoor air quality (IAQ) issues. NQ Environmental currently has a product line that is targeted to medical health facilities (primarily hospitals), industrial air cleaning and have developed a smaller product line which combines the significant parts of the medical and industrial equipment and markets more broadly to include all commercial buildings. NQ Environmental products are high efficiency air filtration and sterilization devices, which are generally installed in a standalone fashion. See the NQ Environmental List of Clients. see the effective and affordable Commercial Clarifier. Is the NQ Environmental line the right choice? Indoor air quality (IAQ) has been a concern for people in the healthcare industry for many years. At the beginning of this century it was discovered that tuberculosis (TB) would spread to other patients in the relatively close confines of a hospital, whereas, the spread of the disease could be checked if the patients were isolated in an environment that provided abundant fresh air and sunshine (the TB sanitarium). Once thought to have been eliminated as a general health threat, TB has made a comeback in a form that is much more resistant to existing antibiotics. TB patients are not only visiting hospitals; they are going to clinics, doctors’ offices, and other public places with confined interior air. In addition, the roll of other airborne antagonists has been recognized as a contributing factor to poor IAQ conditions. These include molds, pollens, smoke, chemical vapors, bacteria and other infectious agents. The health implications of poor IAQ have given rise to the term "sick building syndrome". There are two basic approaches to improving indoor air quality. One is to exchange the interior air with exterior (presumably better) air. The other approach is to clean the existing interior air. (Obviously, a combined approach could be used.) Many new buildings are constructed with windows that do not open and thus rely on their existing HVAC system (heating-ventilation-air conditioning) to achieve adequate indoor air quality. 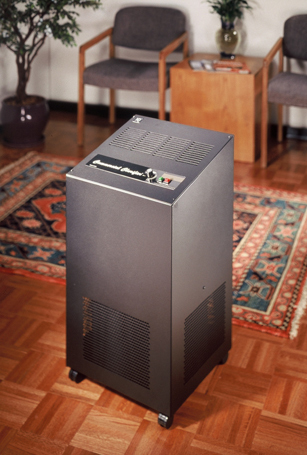 However, simply moving air around in a building does not improve its quality unless it is either exchanged with outside fresh air or is filtered. Most HVAC systems provide only limited filtration for the contaminants mentioned above and very few actually exchange the air. The elimination of TB bacteria (mycobacterium tuberculosis) is especially critical due to the severe health implications. However, the basic options are similar; exchange the air or kill the bacteria in the contaminated air. Thus, hospitals have been building "negative pressure" rooms where the air is continuously exhausted and replaced by fresher air. In this way the airborne contaminates associated with a particular patient are not allowed to travel throughout the rest of the hospital. This approach is expensive and is non-portable. Costs to build a typical negative pressure room range from $25,000 to $30.000. The other approach, killing the TB bacteria, requires a relatively high dose of ultraviolet (UV) radiation. UV radiation "filters" can be retrofitted into existing HVAC systems but the cost of this is considerable as well. The marketplace needed lower cost, more flexible, alternatives. The NQ Environmental line of air treatment systems represent a simple and economical way to bring a room into compliance with the latest guidelines from both the Occupational Safety and Health Administration (OSHA) and the Center for Disease Control (CDC). NQ Environmental offers both free-standing (NQ500) (NQ1000/2000) and wall mounted units (NQ250/400) that have various particulate filters as well as UV lamps. The CDC states that "Air disinfection can be accomplished by ultraviolet germicidal irradiation (UVGI) and by filtration of air, such as through high efficiency particulate air (HEPA) filters." TB bacteria can be killed with a UV dosage of 10,000 micro-W/cm squared or are also generally large enough to be trapped by a HEPA filter. The smallest small wall-mounted unit is 32"x26"x12.5" (NQ250/40) the next largest free-standing system is 78"x26"xl3" (NQ500) and lastly 62"x26"x49" (NQ1000/2000). They are designed with high efficiency fans for maximum air exchange and quiet operation. The units accommodate standard rectangular filters and UV lamps. The use of both a HEPA filter and UVGI provides a fail-safe approach to providing a TB-free environment. While the technologies involved with the NQ products have been available for decades, it is the integration of these technologies into an effective and economical product that represents a real breakthrough. The products require little, if any, installation and can be quickly deployed wherever IAQ is a problem. See the NQ Environmental List of Clients. Is the NQ Environmental product right for your facility? The NQ Environmental existing medical product line users includes operators of healthcare facilities. The NQ Environmental products are used not only in hospitals but also clinics, doctors offices, nursing homes, and mortuaries to name a few. Commercial building operators use the Clarifier (CARE2000), which is an excellent commercial building unit. There were about 12 competitors that manufacture products similar to the main NQ product line. Only 4 remain in the marketplace today. However, only two had both HEPA and UV and NQ Environmental is now the only unit left as a choice. NQ Environmental has conducted a thorough competitive analysis and has detailed comparisons of the features of each with respect to the NQ product. The result is a listing of the "23 Points To A Better Unit" for their top of the line NQ500 system (see below). No competitor has a product that can match the combination of features offered by NQ Environmental. Many are actually more expensive and less functional. As for "The Clarifier", there is no competing product that addresses this market niche; aesthetically pleasing, high capacity air purification systems with carbon, HEPA and UVGI. -- Extended HEPA filter life due to pre-filters. NQ Environmental currently has the best-designed products in the indoor air quality remediation business. The products have been engineered for superior function and economical operation. They represent an attractive option to health care facilities faced with the need to provide indoor environment that is free from airborne infectious agents. The challenges presented by managed healthcare dictate that the players consider economic factors (energy savings with re-circulated and filtered air) as well as function in making purchase decisions. The NQ product line is well positioned to address both sides of the buyer’s checklist. For residential / allergy/ asthma sufferers, or for small facilities, see the effective and affordable Commercial Clarifier. NOTE: The NQ500 can be ordered with a fixed base at no additional cost. This is best when unit is for Neg. Pressure application. The Negative Pressure top has a 10” round duct connector on left side. Re-circulating louvers on right side. A damper plate is installed behind the louvers to adjust airflow An optional top (either Negative Pressure or Re-circulating ) is available.